"Here was a hero that murdered in cold blood. Bam, bam, bam, bam, bam," says Timothy Dalton. "[He was] the dirtiest, toughest, meanest, nastiest, brutalist hero that we've ever seen. That is what started these movies." And it is also what often kept them going, with the Bond character celebrating his 50th anniversary this year and the film franchise enjoying its 40th anniversary last year. But perhaps even more striking than the onscreen insistence of the character was the behind-the-scenes insistence of everyone involved. The World Is Not Enough might have been a Bond title that conveyed his mantra, but it was the mantra of everyone behind the camera too. Even the production company that came together to make it was named Eon Productions. EON was an acronym for Everything Or Nothing. It often was because Bond was frequently one gamble after another. For anyone with a real interest in Bond, Everything Or Nothing is a chronological romp across 50 years, beginning with the fascinating Fleming. Although Fleming was an intelligence officer during World War II, he was largely stuck at home — overseeing two very real intelligence units. 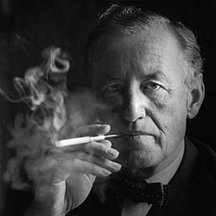 As the film reveals, his thoughts about Bond were very much a collaboration of people who worked in the field as well as a collection of Fleming's own personal demons. He held nothing back. In fact, one of the most striking realizations in the documentary is that Fleming was very likely looking in the mirror the one and only time that he described 007. Although Daniel Craig, the newest Bond, doesn't fit that description, he has captured the persona as the books intended. He is dark and troubled but often triumphant in turning the tide — not unlike the man who wanted to fight in the Cold War. Although largely polished and protective, the film pulls back some curtains. Anytime a film franchise adds to its record as the longest-running in movie making history, it's easy to forget that the series frequently tittered on one disaster after the next, starting with endlessly negative critical reviews about Casino Royal. One of them included the hate of his wife. Once Bond slowly started to migrate to the silver screen, it became worse. The first disastrous film adaption made Bond an American named Jimmy. It attracted Albert R. "Cubby" Broccoli and Harry Saltzman, but they were unable to finance it. The original $1 million budget to produce the first film and Columbia turned them down. Even after it finally found it success, the franchise always rolled along with plenty of peaks and valleys. It made the career of Sean Connery, but also tested whether or not Bond was bigger than the actors who portrayed him. None of them after Connery would escape criticism (and even Connery received some criticism on his return). And ironically, even Fleming and United Artists had doubts about him. He proved his place in his own way, much like many of the actors did over time. In fact, although the feel of the documentary is fluff, it reveals a surprising amount of detail inside its 90 minutes with vintage and new appearances from the people closest to the project. All of it is unafraid of its controversies, much like someone might expect from Bond himself. Everything Or Nothing Targets 6.1 On The Liquid Hip Richter Scale. Although the James Bond franchise has become a cultural phenomenon of sorts, the films seem to have done so in spite of themselves. Behind the scenes, most of the actors, authors, directors, and even the producers made decisions not based on what they felt the public wanted, but on their interpretation and sometimes love of the character originally created by Fleming. While the documentary by director Stevan Riley might leave some Bond buffs wanting more, it is certainly a fine pick for the mildly curious after watching Skyfall. Both the newest film and the documentary make sense of why this British spy thriller has managed to become endearing for generations. 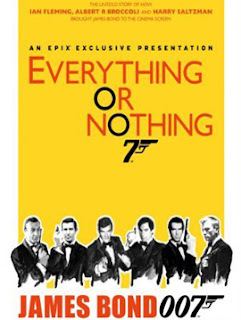 Everything or Nothing: The Untold Story of 007 is available from Amazon. You can also download the movie from iTunes. The latest Bond film, Skyfall (Blu-ray/ DVD + Digital Copy), can also be found on Amazon or downloaded from iTunes too. For more information about Bond like 50 vehicles over 50 years, visit the dedicated 007 website.